Streamline is my new favorite coffee shop in San Francisco. I drove by the place one day and knew I had to come back and enjoy. 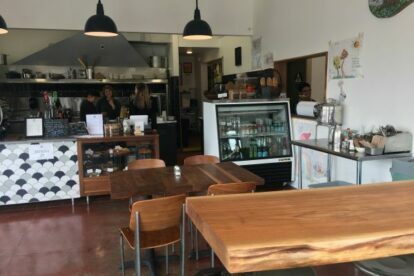 It opened in April 2017 and is only a few blocks from the Great Highway and Ocean beach so it is a convenient place to grab coffee and something tasty to eat to sit and enjoy at the beach. Streamline offers fair trade and organic coffee and bakes all of their muffins, scones, granola and cookies in house. I love their changing breakfast menu and have tried their breakfast sandwich that comes with eggs and arugula on a brioche bun and recently I ate a big breakfast plate that came with sausage, sauerkraut, and a poached egg. Both dishes were delicious and really filling. There is a lot of space to sit either on stools facing the windows or in an adjoining room to the counter where there are lots of tables to sit with friends or work on your laptop. The last time I went, someone sitting next to me was eating what looked like a yummy plate of waffles so I can’t wait to go back and try more deliciousness from Streamline!